There are some things that you can only find on an island. 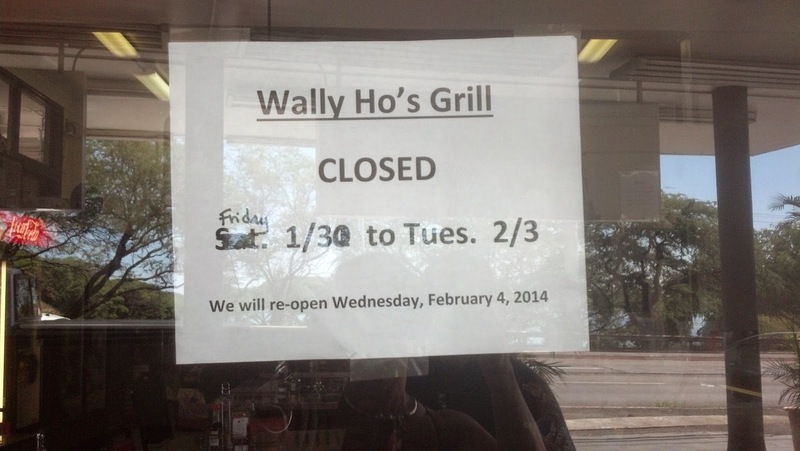 Wally Ho's Garage and Grill is one of those. 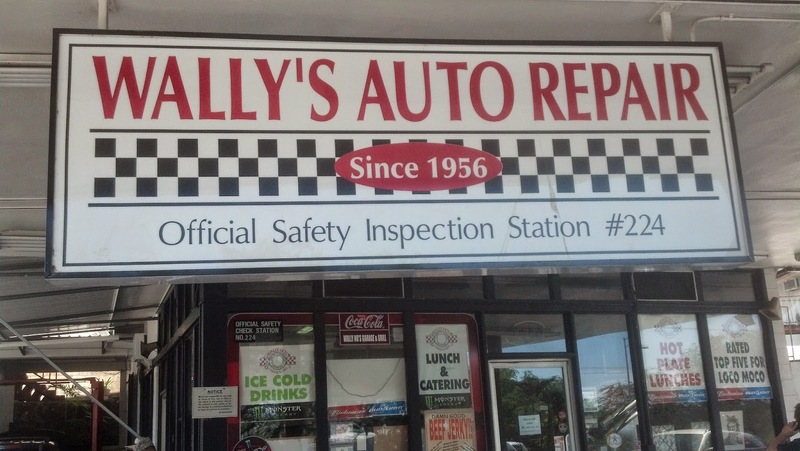 Yes folks, it's a repair shop and a restaurant. All in one. 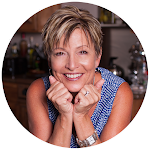 When you actually live on the island, there are things to be done and things to be managed that you don't really experience when vacationing on the island ~ such as renewing the registration tags on your vehicle. The State of Hawaii requires a safety check on all vehicles, which has it's own sticker (much like the registration tags for your license plate). This is the traditional Hawaiian platter of meat (usually ribs or chicken or pulled pork), plus a big ole' scoop of rice, plus a big scoop of macaroni salad, plus a big scoop of potato salad. Hawaiians traditionally eat allot of starch. I see here that they are also rated pretty high for the traditional Hawaiian 'Loco Moco', which is basically a standard hamburger topped with a fried egg and then smothered in gravy. Not exactly low cal. What I also see here is that everything is served with beer. So I guess you can grab a beer or two with lunch while you wait for your car to be repaired. Hmmmm........a garage (that you drive to) serving beer.........so you can get back on the road without being thirsty I guess. 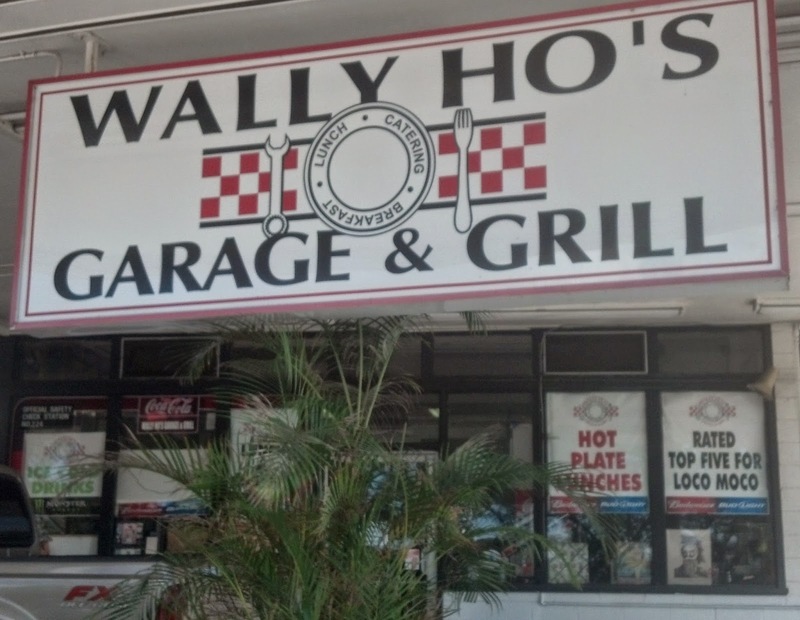 Two things caught my attention here ~ one, that I could have Wally Ho's Garage cater my next luncheon ~ I'm still puzzling over what that might look like. 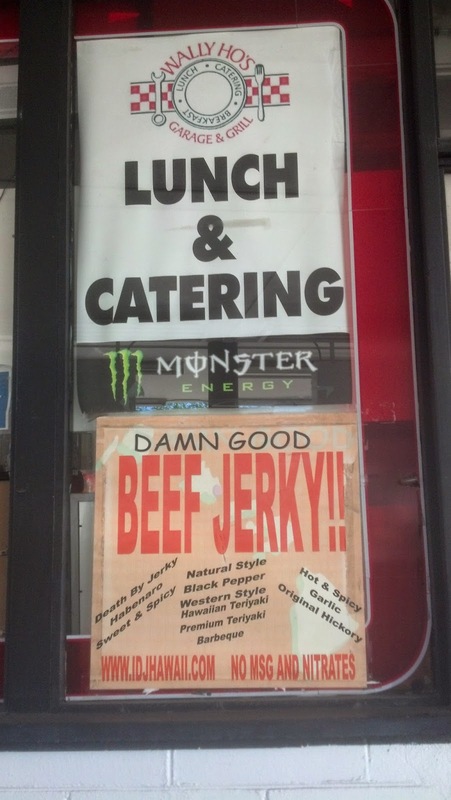 And secondly, I could purchase some Damn Good Beef Jerky (in all kinds of flavors) here at Wally Ho's. 'Death By Jerky' catches my eye. They are also famous for their banana bread ~ but alas, the grill was closed that day. Looks like they took the week-end off. Looks like they decided it was such a good idea they'd just go a day early. Oh wow! This is classic!! But, ya know, there are times I need to do errands on lunch hour and it would have been nice to have something to eat while you wait! This however is a unique combo! Fun story and you guys have the eye for noticing these places. The meals are interesting! 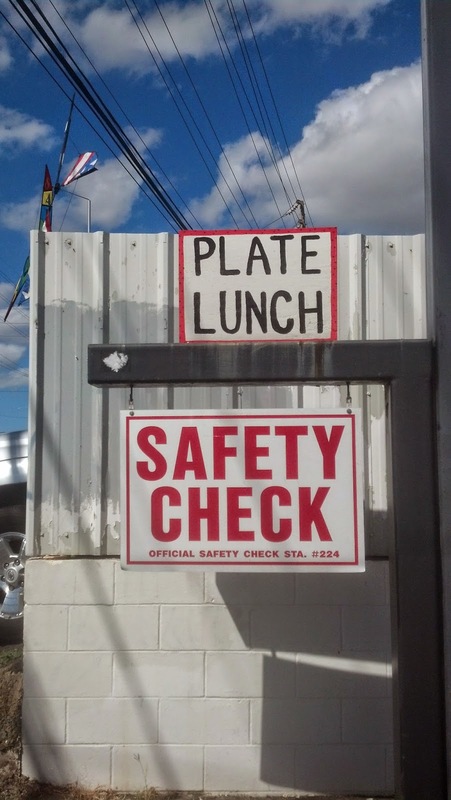 A safety check and a plate lunch! Business minded people for sure! Much about this caught my attention. While I think of Hawaii as being US, much is not the same as mainland US. Offering you beer while your car is being repaired, knowing you are getting right back on the road ~ well, I can't imagine that happening in Cali! But you're right, serving a little plate lunch is very practical, as are the Hawaiian people. And such is island life.